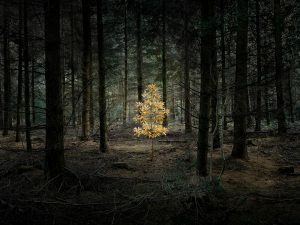 I recently discovered the work of photographer Ellie Davies, whose work has opened up a whole new perspective for me on how the forest setting can be used to great effect within still images. Her approach is very immersive and involves spending time getting to know and feel the forest before starting work on an image. Talking about her process, she says ‘each series will start with walking, sketching and note-making. Walking allows me to familiarise myself with different areas of the forest and select places that suit each image I am hoping to create. I carry a lightweight kit and I usually sit for a while to get used to the space before starting work, listening to the birds and seeing how it feels to be there. You start to hear the leaves falling and the trees creaking’ (Bradbury, 2016). She then spends hours hand making or painting props and attaching them to the trees, before capturing the perfect image. The resulting shots challenge the viewer to ‘consider mankind’s relationship with nature and to explore our cultural perceptions of forests in popular culture, folklore, literature or film’ (Bradbury, 2016). The magic within her work is in ‘her knack of turning reality into a dream-like vision that verges on hyper-reality’ (Bradbury, 2016). 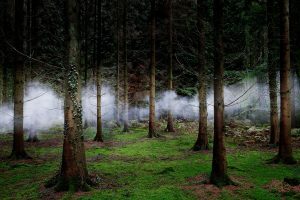 In some of her projects she introduces elements into the scene, such as clouds of smoke, painted trees, fern pathways, or even galaxies of stars, superimposed over forests. There are no people or animals in her photographs. The landscape itself is the character. 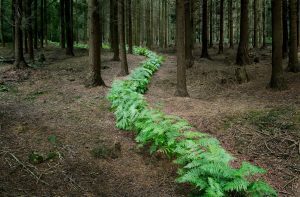 In her artist statement, she explains how her work ‘explores the ways in which identity is formed by the landscapes we live and grow up in’ (Davies, n/d) and that the landscape images she creates ‘are a reflection of my personal relationship with the forest, a meditation on universal themes relating to the psyche and call into question the concept of landscape as a social and cultural construct. 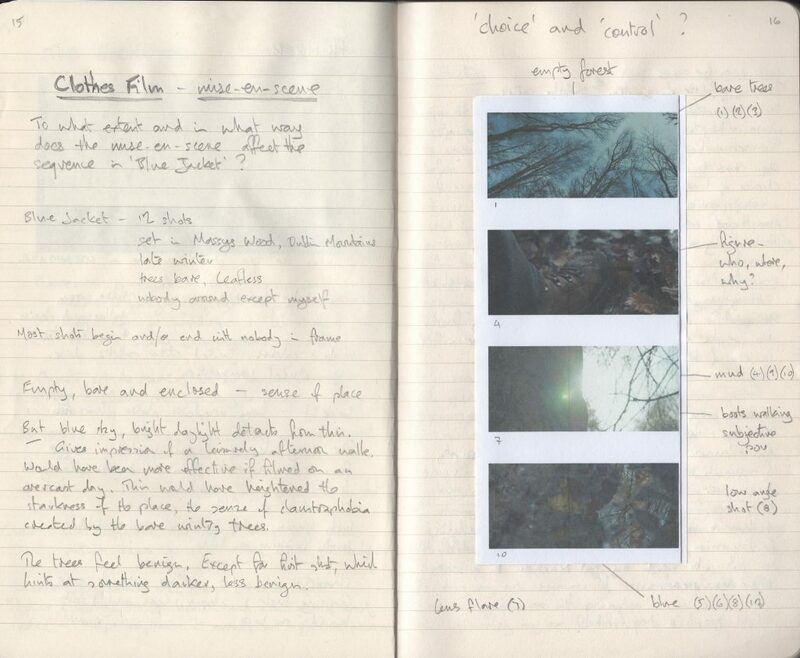 Most importantly they draw the viewer into the forest space, asking them to consider how their own identity is shaped by the landscapes they live in’ (Davies, n/d). Like Davies, I too am interested in identity and how it is formed by the environment in which we live and grow. I like the way in which she creates images that are reflections of her personal relationship with the landscape. I also like the way she describes her work as ‘a meditation’ on universal themes. In some way, I would like to create moving images that do the same: that reflect my interest in identity and place; that are reflections of my personal relationship with specific places; that are meditations on universal themes. Looking back at my first assignment and follow up research on the cultural meaning of forests, I think this could add a new dimension to my approach when working on new projects. Particularly in terms of creating moving images that challenge our perception identity and place. To what extent does mise-en-scene affect the sequence in my clothes film? How does the scene feel? The sequence opens with a low angle, rotating shot looking up through the tree canopy. This opening shot of the trees, bare and lifeless, in silhouette against the sky, sets a dark, slightly oppressive, wintry mood within the sequence. Bringing us down to ground level within the forest, the second shot frames a figure walking through the trees into the distance. 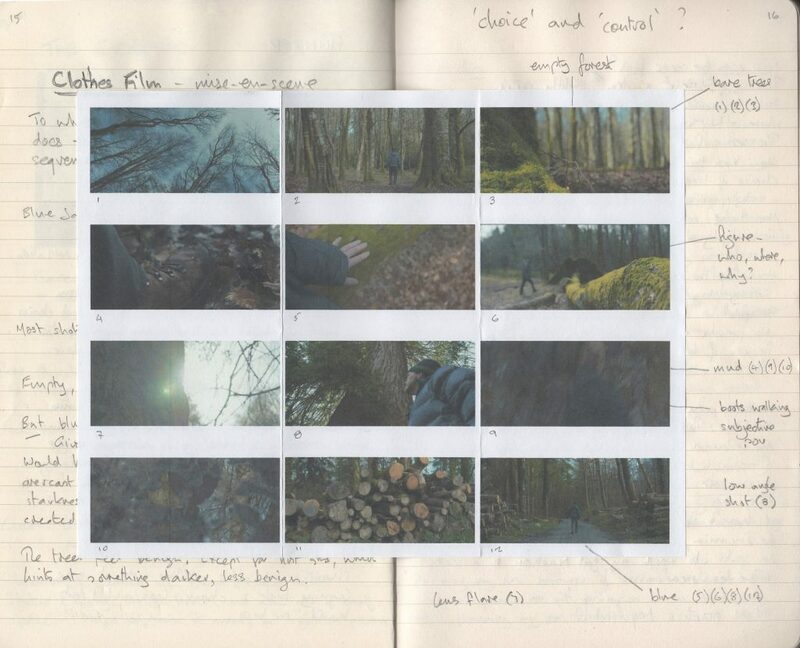 Subsequence shots show the forest floor, the figure’s boots in the mud and hand moving along the trunk of a fallen tree, and a flare of sunlight. We see a figure, out of focus, in the distance, stepping over a fallen tree and again in close up, standing beneath an old redwood tree. There is a sense of mystery, as we are left wondering who the figure in the forest is. But these questions are left unanswered, as the figure disappears back into the forest. How has this been achieved? How has mise-en-scene played a part in this? Is there any meaning conveyed through the mise-en-scene? On looking back at the mise-en-scène and its effect upon the sequence within the clothes film, I now realise how important it is to consider everything within the frame before I start filming. I think my use of mise-en-scène within the clothes film (i.e. setting, costume, lighting, staging) contributes to the atmosphere and meaning of the sequence in several ways. The forest setting is clearly a place that is empty and dormant, yet the trees, bare and lifeless in their winter state, are still quite majestic. The costume worn by the figure (walking boots, hat and fleece jacket) is appropriate to the wintery setting. The blue jacket contrasts with the subdued colours of the forest, helping to emphasise the human figure and picking it out against the background. Apart from the opening shot of the trees, there is a bright natural light within the landscape that helps give a benign feeling to the forest. This is in contrast to the opening shot that hints at something darker and more claustrophobic. The figure in blue moves through the forest with a sense of purpose. Though what that purpose is remains unknown. However, having looked at the part played by mise-en-scène in the sequence and the atmosphere and meaning conveyed within it, I still feel there is much lacking both visually and in terms of meaning within my film. This has been a very useful exercise for me. It has opened my eyes to the importance and cinematic power of mine-en-scene, and provided me with a vocabulary and grammar for the analysis of mine-en-scene in my own work. This task has also revealed a number of flaws in my approach to mise-en-scène that need addressing as I move forward in my moving image practice. Looking at other films and analysing the ways in which other filmmakers use mine-en-scene to convey meaning within a scene will prove an important step forward in my own moving image practice. Building my own resource of research material will provide me with examples I can draw upon when planning my own moving images. Having looked at the cultural meaning of forests, I decided to ask myself the question: how do I represent the darker side of the forest more successfully within my moving images? By considering the cultural meaning of forests. By applying specific camera techniques. Camera techniques – the smallest camera moves can have the greatest effect. For example: by moving a POV shot through an empty space to make the viewer worry that something is about to happen or appear; or by creating fear and tension by showing nothing. The ‘Subtle Dolly’ is a camera move that is ‘so slight that the audience won’t notice the camera moving, but will feel uneasy’ (Kenworthy, 2012:60). It’s a camera movement that can be used when characters are moving through a dangerous space. As the actor moves slowly towards the camera, the camera moves back very slightly, giving the audience the feeling they are backing into dangerous territory. The camera is set up pointing toward the actor, and she/he is moving toward the camera. The actor looks off to the side or above, but their movement should be directly toward the camera. The camera should move back a short distance and the actor come to rest close to the camera. This is a technique that was used to great effect by Stanley Kubrick in The Shining (1980). When a character moves through an unpleasant place, tension can be created by letting the audience see things exactly as the character would see them, by moving the camera through empty space. The power of this effect rests in the fact that in film, ‘when you push in (or move toward) something, it can signify a thousand different things, but it nearly always means something has changed. To push through empty space means you echo the human experience of walking through a frightening place, while also using a cinematic signifier of change’ (Kenworthy, 2012:66). Set up at eye level with the actor, the camera moves slowly backward at the same pace as the actor moves through the corridor. Turn the camera round and shoot the same scene from the actor’s point of view. In films, the things that are not seen are more frightening than the things that are seen. As a technique, this works well within the context of an ongoing, protracted chase. Juxtaposing a static close up shot of an actor with a handheld POV shot will unsettle the audience because they don’t know what is happening, creating fear. The camera is set up with a close up on the actor looking afraid. The camera should be static and quite still. The POV shot should be handheld and at an unexpected angle (e.g. in a city, the character could be looking up at street signs; outdoors, the character could be looking up at the tops of trees). ‘The fear of a place is one of the most powerful ways to convey a character’s unease’ (Kenworthy, 2012:126). The aim here is to capture a moment in which the character is literally and metaphorically backed up against the wall in a relatively open space. Place the actor against a wall or object, and position the camera as close to the wall as possible. Frame the actor so that she is to one side of the screen, revealing the dark space behind her. Then reverse the camera and shoot a POV shot, showing the empty space she is looking at. I think each of these camera techniques have the potential of creating similar effects within a forest setting. 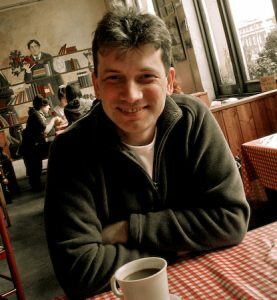 The question of ‘identity’ and ‘place’, and the interconnectedness between the two, is an important one for me. In my first assignment, I set out to create a moving image that depicted the relationship between ‘identity’ and ‘place’. However, the resulting film depicting a figure dressed in a blue jacket walking through a forest barely scraped the surface of what I had set out to do. So I thought I would follow up on some of the issues raised by my tutor in his feedback on Assignment 1. In order to develop ‘a more focused, individual and potential meaningful conclusion’, my tutor suggested I explore and reflect upon ‘the cultural meanings that the forest might hold as well as the different ways that it has been dealt with by artists and filmmakers alike.’ Two things I had not considered when preparing for my first assignment. In many fairy tale and folklore narratives the forest is often dark and a source of evil. The dark forest is a place in which we must face up to our fears and conquer them. This representation tends to generate narratives in which the forest becomes an obstacle the protagonist must overcome in order to reach their goal. A location through which they must travel, often at a price. The forest has a broad range of cultural meanings, from enchanted place, to sanctuary from civilization, to ‘expression of the mind’ (Mullins, 2017). As ‘enchanted place’ the forest occurs in folklore and modern fantasy, often portrayed as magical places unknown to characters and as places of transformation. In fairy tales the forest is a magical realm and place of danger. German fairy tales in particular tend to take place in forests, such as Snow White, Hansel and Gretel and Rumpelstiltskin. Forests are also found in mythology: in the Sumerian epic of Gilgamesh; the Norse myth Myrkviðr (Mirkwood); and Ovid’s Metamorphosis. Many trees have their own magic and myths associated with them. The image of the Tree of Life or World Tree occurs in European mythology, such as the tree Yggdrasil from Norse mythology. Seen as a link between heaven, the earth and the underworld, Yggdrasil features in the Icelandic Poetic Edda. Aguirre, Wrath of God (1972) Directed by Werner Herzog – adrift on a raft in the Peruvian jungle, a band of conquistadors searching for El Dorado find the horror within themselves. Deliverance (1972) Directed by John Boorman – man against nature; a gruelling psychological journey into the unknown and potentially dangerous wilderness. Fitzcaraldo (1982) Directed by Werner Herzog – the folly of man against nature; a wilful obsessive who will stop at nothing to build an opera house in the Amazonian jungle. The Emerald Forest (1985) Directed by John Boorman – based on the true story of an American engineer’s obsessive search for his abducted son in the Amazon jungle; the conflict between the ecological ethic of an Amazonian tribe and the corporate interests of modern civilisation; ancient wisdom based on dream time versus the ravaging of the earth characteristic of modern progress. Medicine Man (1992) Directed by John McTiernan – an eccentric biochemist discovers a cure for cancer in the Amazonian rainforest; portrays the issue of deforestation. The Blair Witch Project (1999) Directed by Eduardo Sanchez & Daniel Myrick – a supernatural horror; a fictional legend shot in the style of a documentary. The Village (2004). Directed by M. Night Shyamalan – uses the dark forest symbolically. A Midsummer Night’s Dream (2016) Directed by David Kerr – BBC adaptation of Shakespeare’s play. Embrace of the Serpent (2016) Directed by Ciro Guerra – a surreal parable told from the perspective of the last surviving member of an Amazonian tribe. I think the Russian proverb ‘if you’re afraid of wolves, don’t go into the woods’ is a good place to start in my own exploration of the forest and its function in moving images. On one level it means exactly what it says: don’t go into places that you know will frighten you. However, I also think there is another, much deeper dimension to this proverb than that of a simple warning: the forest can also be an ‘expression of the mind’; the external manifestation of the character’s inner world. I particularly like the idea of connecting what we see on screen with what is going on inside the character’s mind. In many films the forest is more that a setting, it is a metaphor for something darker and more complex than a landscape of trees. It’s a place in which characters must face up to their darkest fears and overcome them, whatever the odds. From this standpoint, the forest as a place of labyrinthine complexity capable of confounding all who enter its realm could be seen as a place of darkness, disorientation and transformation. All of this points to a forest that is very different to the one I portrayed in my first assignment film, which my tutor describes as ‘a very generic and placid version of the forest, a place that is easy to negotiate for a leisurely Sunday stroll.’ From a storytelling perspective, the forest has the potential to be so much more than this. 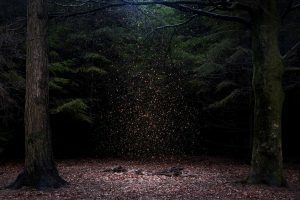 So what I need to do now is look at some of the ways in which I could explore ways of using the darker side of the forest, in both storytelling and cinematic technique. This follow-up research on the cultural meaning of forests has opened up new pathways into my exploration of ‘identity’ and ‘place’ within my own moving image practice. Especially in terms of how I use character and setting, which are inextricably bound together, as two intertwined elements of the same thing. For me, one way of looking at character and setting in a moving image is in terms of ‘figure’ and ‘place’, in which ‘place’ is the visual manifestation of the ‘figure’s’ inner world. Dad’s Stick features three well-used objects that were shown to the artist by his father shortly before he died. Two of these were so steeped in history that their original forms and functions were almost completely obscured. The third object seemed to be instantly recognizable, but it turned out to be something else entirely. Focusing on these ambiguous artifacts and events relating to their history, Dad’s Stick creates a dialogue between abstraction and literal meaning, exploring the contradictions of memory to hint at the character of “a perfectionist with a steady hand” (John Smith). My tutor suggested I look at ‘Dad’s Stick’ by John Smith. ‘Dad’s Stick’ is a tribute to the artist’s father. 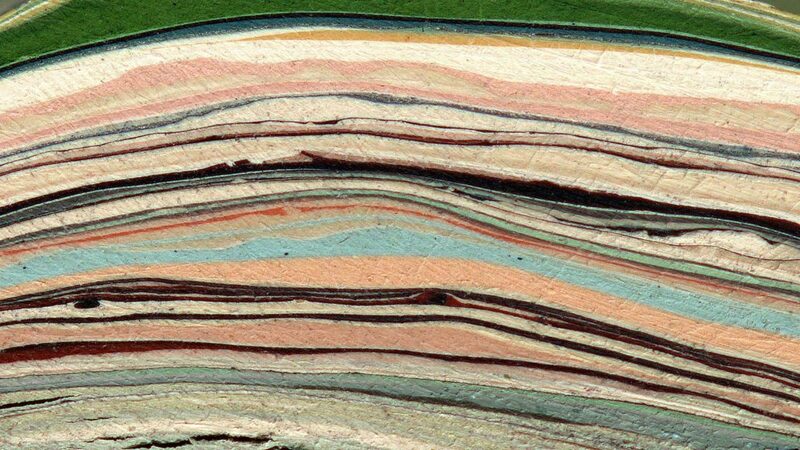 It opens with what appears to be an abstract multicoloured image of colours layered like stratified rock. It is then superimposed by the text: ‘My dad did a lot of painting.’ In the background we can hear the sound of knocking; wood on wood, maybe. The film goes silent for a few seconds as see some more frames of the abstract multicoloured layers, superimposed with texts. Then we cut to a series of plain coloured frames (beige, green, brown, off-white, black) superimposed with further captions, starting with ‘Dad’s colour preferences changed over the years.’ Eventually, we cut to an image of a stick, superimposed with the text ‘Shortly before he died he showed me one of the sticks that he used for stirring paint.’ It’s at this point we realise that we are looking something completely different; the cross-section of his father’s painting stick. It’s a wonderful moment. Smith’s ‘Dad’s Stick’ is a delightful film. It’s a playful game with images, words and meanings. What at first seems like an abstract painting is in fact the cross-section of a wooden stick his father used to mix household paint before applying it to the walls of his house. What appeared to be an abstract multicoloured image is in fact the layers of paint that became encrusted on the stick over decades of painting the house. Our expectations are completely overturned by the insertion of one image, the stick. What I like about this film is its simplicity. There are only a handful of static shots, a few superimposed captions, a couple of sound effects of knocking on wood and stirring in a teacup, and the artist’s voice in the background, singing. Yet, it’s within so few images and sounds that our perceptions are challenged and, more importantly, we are drawn into the film space and asked to recall memories of our own parents. As I was watching the film it got me thinking about my own father and an item that once belonged to him; his large, brown tape measure, that travelled all over Cheshire with him whenever he went on site as a Cheshire County Council architect.